Let’s face it: Plants were not meant to be grown indoors without natural sunshine. By replicating natural habitats, we have managed to decorate our homes and offices with gorgeous greenery, but when it comes to indoor palm trees there are three species that do particularly well inside that don’t cost a bundle. We’ll tell you what species of palm tree to buy and how to grow them. Think about height restrictions when choosing a palm tree as some tend to stay short while others strive to become tall trees. You can’t top-trim a palm tree as it grows (it will die), so if you prefer the type that grows taller than your space allows, enjoy it while it lasts and know you’ll need to replace it. To keep the tree from growing quickly, don’t re-pot it into a larger pot until absolutely necessary. Buy the healthiest palm that you can find by eliminating palms with brown leaves, funny smells, or off-looking soil. Check the back of the leaves for mealy bugs (little white spots) and other pests or diseases. See if the container is cracked to determine if it needs to be re-potted — this isn’t a bad thing, but you’ll need to factor this in if working on a budget. This video gives a nice overview of caring for palm trees inside the house. Most palm trees like bright light though some will thrive in low-light situations so place palms near windows or skylights though even artificial light helps in office buildings or similar. And, much like in its natural habitat, palms prefer humidity which is absent from most indoor spaces. Watch re-circulated air as heat or air conditioning can dry out leaflets though no circulation can provide a breeding ground for insects and prohibit photosynthesis. Don’t let the palm tree’s soil completely dry out before watering again. Test the top inch and if it’s dry, then it’s time for more water. Do make sure the pot has good drainage otherwise the roots will rot. Also, tap water contains salt which over time will build up in the pot so it’s recommended to leach the palm tree soil by watering the salt out. A few times a year, use a hose to flush the salt thoroughly out of the soil (roughly the equivalent of 10 waterings) outside and let it dry. Palm trees do need regular applications of fertilizer to keep them healthy. However, since they grow slower than outdoor palms, their fertilizer needs are less than outdoor equivalents. Potassium deficiency is common in palms (the leaves will brown or yellow) so use a palm tree fertilizer that contains potassium and manganese. Don’t over prune the palm tree as they draw nutrients from their leaves. Just remove fully brown leaves and make sure it has plenty remaining. 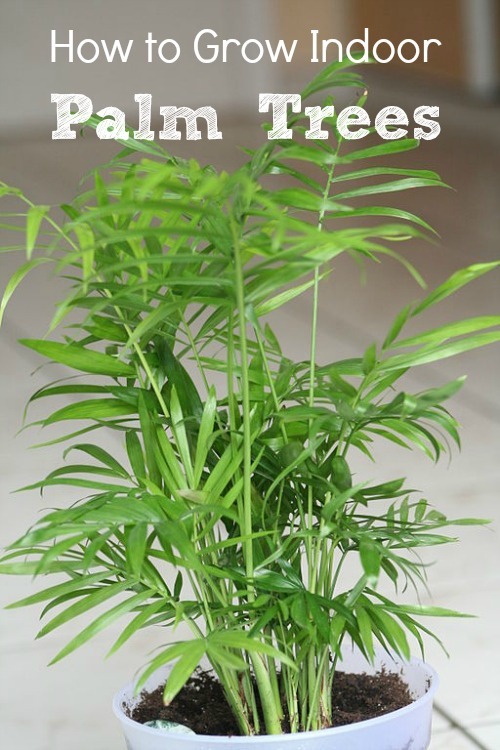 For palms that prefer humidity, fill a spray bottle with water to occasionally mist the leaves. You’ll also want to do this in the winter if you’re running the heat. PRO-Tip: Some experts recommend watering palms by placing them in the shower in order to replicate a tropical storm though this might not be practical to do with larger palms. This easy-to-care-for palm is native to Australia and can even do well in low-light situations. It is usually sold in pots that contain 2-3 plants of varying heights, though it often looks like just one plant. 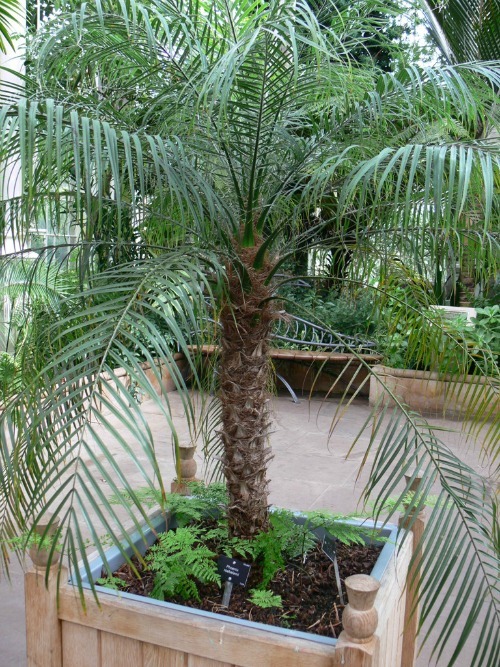 Restricting the pot size helps keep this palm slow-growing as it could reach 15-20 feet indoors if allowed. This palm is also popular because it has the typical tropical look of arching palm fronds and can survive if the soil dries out between watering (though this isn’t ideal), but it will thrive in situations with light, air flow and good watering habits. This palm isn’t as robust as the Kentia palm, however, it will do well indoors if given the right attention. The difference in look is that the Sentry palm’s leaflets grow more upright and the little leaves have a curl to them. These palms need a regular watering schedule otherwise they’ll weaken. This gorgeous palm does well indoors and outdoors in shade though they do not like direct sunlight in either case. The fronds have a finger-like, deep green fan and it does come in rarer variegated varieties. Lady palms tend to need pruning at the bottom to maintain a more upright versus a bushy appearance, because new stems sucker or clump at the bottom. Because they don’t grow quickly, these palms are usually more expensive than others. The parlor palm (shown in top photo) can tolerate low levels of light though it would prefer indirect sunlight while indoors. 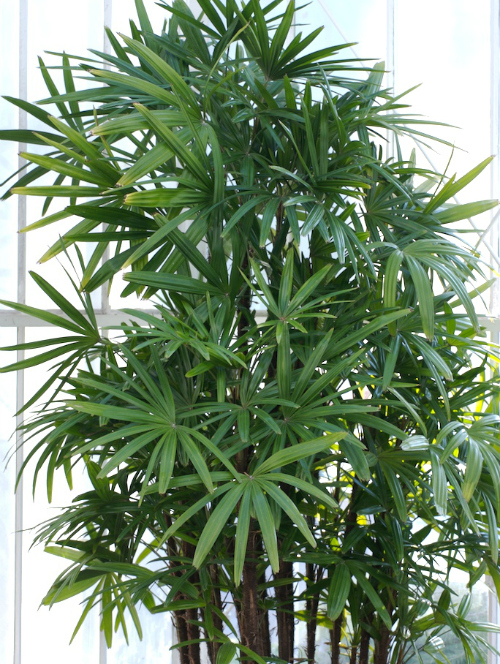 In a pot, it will stay at about 5-6 feet tall, usually, making it a great indoor palm and like the Kentia palm, it’s sold in a grouping of up to 20 plants in a pot. Consider misting the palm for some extra humidity. 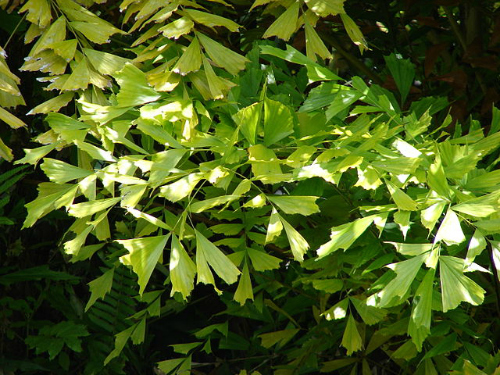 The fishtail palm earns its name from the leaves that are shaped like — you guessed it — fish tails. It’s actually a sensitive plant to grow indoors that will require occasional misting, however, if you monitor for bugs and keep it well-watered and fertilized, this Asian beauty will earn plenty of compliments. The fishtail palm can get up to 10 feet tall in a pot, but expect to see them at heights of 60 feet in their natural environment. The pygmy date palms are also commonly purchased and grown as several seedlings in a pot and love very bright light, including direct sunlight. Be aware that pygmy date palms have very sharp spines so unless they are out of the way of traffic or you intend to prune the spines, they may not make a great indoor palm choice. It’s the only date palm suitable for growing indoors and the palm fronds can be kept green by adding magnesium sulfate as a fertilizer. This is by no means a complete list of indoor palms, but rather ones that are commonly found in nurseries that are easy to grow. Do you have any tips or ideas to share regarding indoor palms? Photo credits – parlor palm: Pluume321 (Own work) GFDL/CC-BY-SA-3.0, via Wikimedia Commons; Lady palm: Eric in SF, Creative Commons 2.0 via Wikimedia Commons; fishtail palm: Forest and Kim Star CC-BY-3.0 via Wikimedia Commons; pygmy date palm: Prashanthns (Own work) GFDL via Wikimedia Commons.